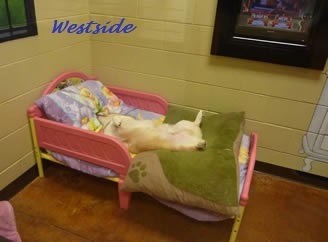 Talk about luxury, our Hotel Suites are the life for the pampered pooch. 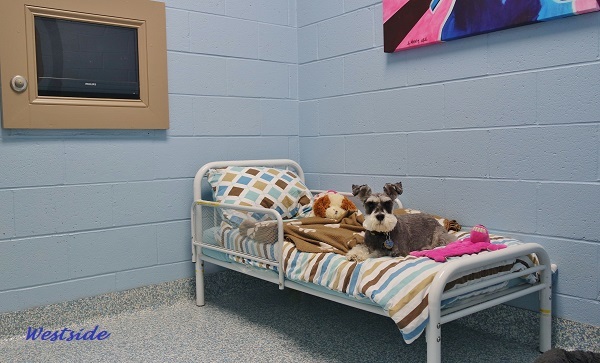 Each dog gets their own private suite (multiple dogs in the same family can share.) Suites are complete with rugs, a full-size toddler bed and, of course, a flat-screen TV on the wall. All suites have large windows for seeing what is going on. The suites provide a quieter environment. 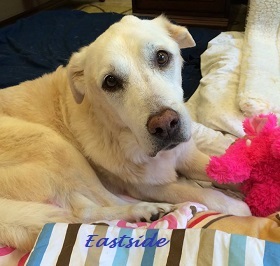 This is perfect for the ultimate spoiled pooch or for the a dog that is very nervous or easily stressed. We are proud to offer a wide variety of movies such as; "Lady and the Tramp", "Air Bud", "The Fox and the Hound", "101 Dalmatians" and much more. 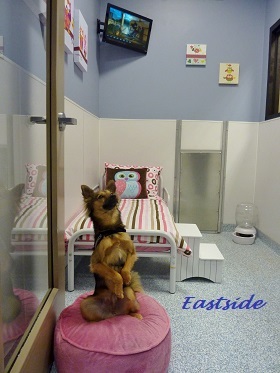 At our Eastside location each suite guest has access to their own private mini-yard for potty breaks; at Westside suite guests are taken outside four times a day to strecth their legs, go potty, get attention from the staff, and get a little bit of sunshine. 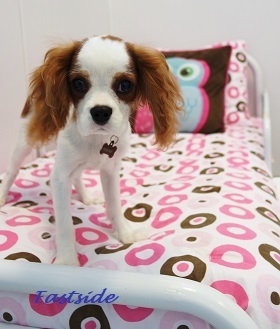 Click here to learn how to enroll your pet for our Luxury Suites. Click here to learn what extra perks can be added.